NewsBusters has reported on the newly released Lean Forward spot, in which Rev. Al Sharpton invokes the Pledge of Allegiance. Oh yeah, but he “forgot” to include “under God”. You can see the ad and read NewsBusters’ commentary here. It’s a known fact that Lean Forward is code for Left Forward and Al Sharpton is nothing more than another in a long line of ill-informed, myopic-sighted, sparsely talented mouthpieces for a leftist organization that is methodically endangering “liberty and justice for all” by pushing its agenda to delete all references to God and Christianity in the American culture. “If we ever forget that we are one nation under God, we will become a nation gone under,” is how Ronald Reagan said it in 1984. Is there any question that America is fast becoming a nation going under? 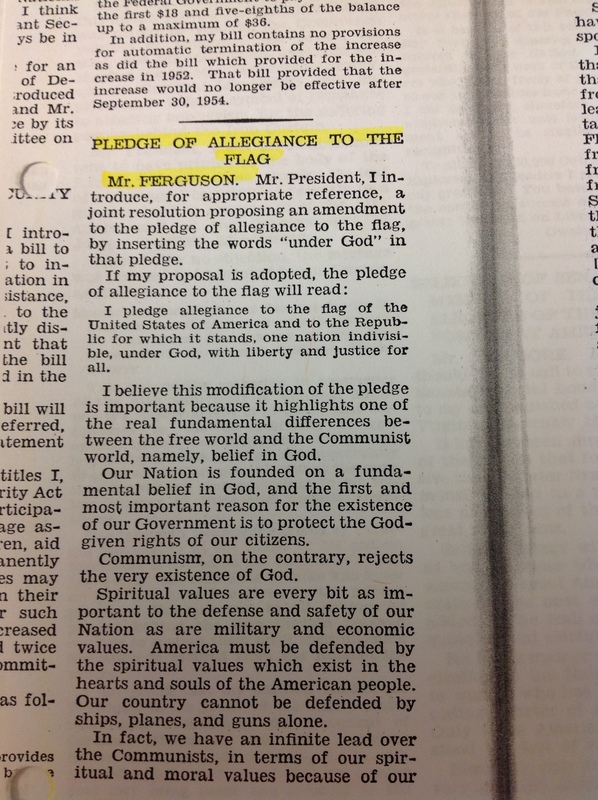 Attacks on the Pledge of Allegiance have long been the issue du jour for leftists. It’s that pesky little phrase, “under God”, that just “causes (their) skin to crawl” as one atheist complained. But, here’s the deal: without God, there is no chance for “liberty and justice” for anyone. As the author of two books on the history of the Pledge of Allegiance, I refuse to allow the leftists to re-write the history of the Pledge. Yes, the author of the Pledge of Allegiance, Francis Bellamy, was absolutely a dedicated “Christian socialist” who, along with his novelist cousin, Edward Bellamy, promoted socialism in the political, academic, and religious arenas. But, Edward died not many years after becoming a best-selling author of his influential book, Looking Backward. So, there is no way of knowing if he would have continued his quest for a socialistic America. But, Francis Bellamy did NOT … repeat, did NOT … remain a socialist as he grew and matured. Quite the contrary, he seems to have enjoyed the fruits of his capitalist labor during his career until he died in 1931. 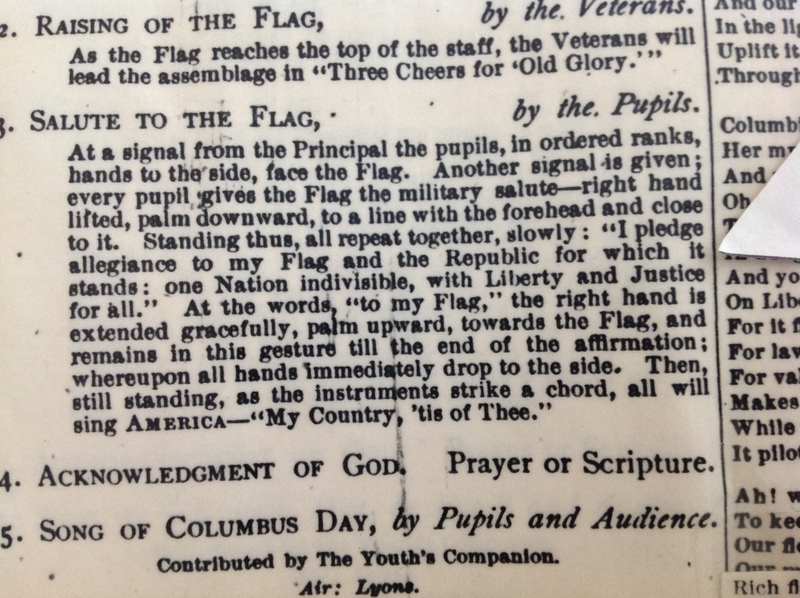 The Official Programme sent to the half million Companion subscribers included the original Pledge of Allegiance: “I pledge allegiance to my Flag and the Republic for which it stands: one Nation indivisible, with Liberty and Justice for all.” The very next step in the program states: “Acknowledgment of God. Prayer or Scripture.” Let the record show that God has always been a part of the recitation of the Pledge of Allegiance, albeit not written into it until 1954. And, doesn’t that just make sense, knowing that the vast majority of nineteenth-century Americans adhered to the Christian religion? 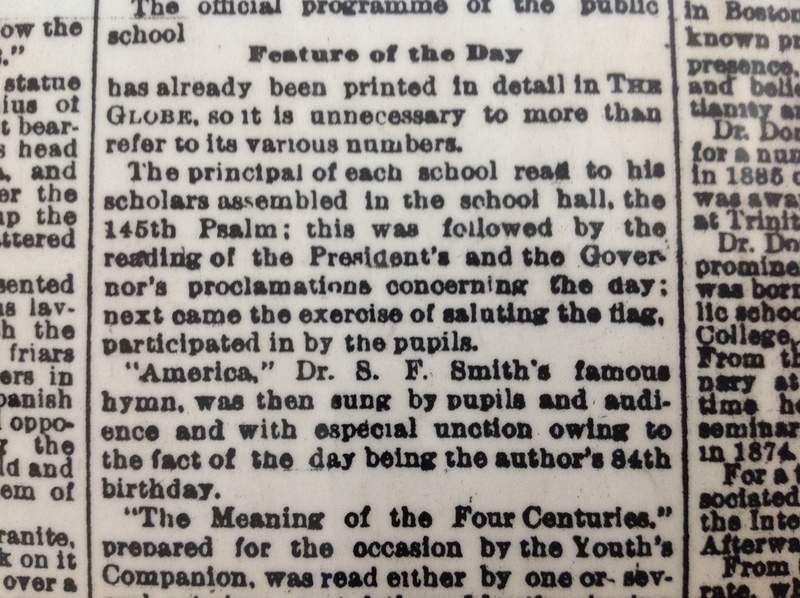 As a matter of fact, the October 21, 1892 edition of the New York Times records that, in Boston, Psalm 145 was read aloud in its entirety by the principal of every public school to the student body. That was how Boston chose to enact its “Acknowledgment of God”. Bellamy, who lived and worked in Boston, attended the celebration in Boston. MSN has poured millions into the Lean Forward campaign hoping to boost ratings (and ultimately topple FOX News) by getting people to “think bigger, listen closer, fight smarter, and act faster.” May I suggest that you add “learn history” to your list? Enough Celebration of Diversity … Let’s Try More Unity! I’m all for diversity. But, enough already! Let’s try a little UNITY in place of DIVERSITY for a while. I’m referring to the Fort Collins high school that recited the Pledge of Allegiance over the loudspeaker this week … in Arabic. Seems as if the students in the Cultural Arms Club, which seeks to “destroy the barriers and embrace the cultures”, initiated the action. Out of courtesy, they asked permission from the principal, Tom Lopez, before they did it. He approved and now he is suffering the wrath of outraged parents. Listen, if this were a rare occurence, I would not be opposed. A bunch of high school kids wanting to do something different is really no big deal. But, you’d have to be living under a rock these days not to realize that a large percentage of Americans are fed up with seeing one revered American tradition after another thrown aside to make room for the almighty sacrament of diversity. Ironically, the Pledge of Allegiance was written to unify Americans during a time when America was very divided. It was 1892 and labor strikes, immigration, and the rise of socialism were all contributing factors to an America that was becoming more and more separated. The Pledge was written to be the highlight of the events surrounding the 400th anniversary of America’s discovery. Indeed, Americans did unite around the flag and the Pledge. So, here is what I suggest. Say the Pledge of Allegiance in English. It was written in English. It has been recited by millions and millions of Americans … in English. We have a saying here in America: “If it ain’t broke, don’t fix it.” Let’s apply that principle to the recitation of the Pledge of Allegiance. In English. Stories abound these days of people, schools and communities that wish to do away with the Pledge of Allegiance and flying Old Glory. I regularly document such occurences, hoping to raise awareness about the dangers of doing away with patriotic fervor. But, in honor of Veteran’s Day, I’d like to turn the corner and highlight a few locations in America that are red, white and blue to the core. Just this week, I read about the Bayshore Patriots, a group in Tampa Bay, FL who regularly gather at Patriot’s Corner every Friday during evening rush hour to fly the American flag. For the last ten years, as a way to express their patriotism after 9/11, the Bayshore Patriots have shown up at the same location from 4:30 – 6:00, rain or shine, to wave Old Glory. Last year, they added a monument of sorts – a steel beam from the World Trade Center – a symbol of a nation still standing after being attacked. The group plan to continue their patriotic flag waving until every troop returns home from war. Dave’s All American Pizza in Danville, IN is another example of a business with a patriotic flare. An enormous American flag greets guests and a 20 foot tall replica of the Statue of Liberty stands watch in the main dining room. The parking lot has special spaces reserved for veterans and nearly every branch of the military is represented by manequins wearing the uniform. Veteran’s Day eats are pretty good, too. This Veteran’s Day, Dave is serving up free prime rib for the lucky vets who come to see this all American eatery. Finally, there is Chick and Ruth’s Deli in Annapolis, MD. Proprietor Ted Levitt, a true red, white and blue patriot, began the tradition of reciting the Pledge of Allegiance every day in his deli in 1989. That’s right. Every day of the week, no matter how busy, the entire restaurant stops, stands up, faces the flag over the register, places their hands over their hearts and recites the Pledge of Allegiance. That’s me with Ted when he graciously allowed me to lead the Pledge of Allegiance after I published my children’s book, America’s Story: A Pictorial History of the Pledge of Allegiance. My new book for adult readers, Saving One Nation Under God, was released this week and is available on Amazon. If you ever visit these locations, please be sure to stop in. Democrat Nikos Zitis, candidate for a New Jersey township committeman position, simply refuses to recite the Pledge of Allegiance, saying that “it doesn’t mean you’re more patriotic to recite the Pledge.” Zitis became an American citizen in the mid 90s, having been born in Cypress. He has lived in the United States since 1983. In an article about the controversy, Zitis is also quoted as having decided “there is no God”, another reason he is adamant about not reciting it. It is no surprise that people who do not believe in God are the most likely to not like the Pledge of Allegiance. It is interesting to me that the entire nation is having a conversation about God in America at the same time it is having conversations about the rise of socialism in America. It almost seems as if both topics have increased proportionally. Why would that be the case? Could it be that the Judeo Christian heritage this country embraces understands the connection between God and freedom/religion and liberty/Christ and self determination? I propose the answer to that question is “yes”. If Mr. Zitis does not wish to recite the Pledge of Allegiance, it is his right to do so. As Americans, we allow freedom of expression. Just remember this … the freedom to bash/disrespect/dishonor/tear down America is brought to you courtesy of the rest of us who DO BELIEVE IN ONE NATION UNDER GOD! Controversies are brewing about the Pledge of Allegiance all over the nation. Currently, there are three communities where Americans “offended” by the Pledge are fighting to remove it from schools. The case that seems to elicit the most puzzlement is happening in Seattle, where an Air Force vet is simply beside herself with angst over the thought of her daughter being exposed to the Pledge. John Stanford International School (JSIS) is the type of school you likely have never heard of. I certainly had not until this story. It is an “immersion” school, a school where, for half the day, the students learn their lessons in either Japanese or Spanish. Great way to teach young children a second language. On its face, I’m all for that. Its mission seems focused on proficiency in a second language at an early age, although it also speaks of “cultural diversity”, a moniker that is getting tiresome. That, I am not so much in favor of if for no other reason than the pendulum has swung too far in the direction of diversity, leaving commonality to die on the vine. I am also against eliminating the daily recitation of the Pledge of Allegiance, which, by the way, is mandatory according to state law. Every state in the nation has a similar law, although the practical application may be somewhat patchy. Also part of Washington’s law is the option for children who do not wish to recite it to sit quietly and respectfully while their classmates participate. No child can be punished for not reciting the Pledge of Allegiance. Sounds reasonable to me. But, not to US Air Force veteran Stacy Sides, who says she specifically chose to move to Seattle to send her daughter to JSIS. The focus on multiculturalism was enough of an attraction to her to change her residence so that her daughter could have a global perspective on things. Here is some advise for Sides: Use the recitation of the Pledge of Allegiance as, what your generation likes to call, a “teaching moment”. Teach your daughter that in America, there are all sorts of people. And those people are FREE to believe all sorts of things. And the reason they are FREE to believe whatever they choose to believe is because we are ONE NATION UNDER GOD, INDIVISIBLE, WITH LIBERTY AND JUSTICE FOR ALL. Teach her that other nations – and they are many in number – do NOT allow their citizens to believe whatever they want to believe. In other words, they are NOT FREE. Lastly, teach her that, in order for all Americans to remain FREE, we must have a common foundation on which to stand. A foundation that has proven to protect the right of humankind to live freely. A foundation that, because of FREEDOM, is not perfect, but is remarkably self-correcting. A foundation that respects the rights of all individuals. Sit down and discuss those principles with her and then give her the choice (another practice your generation is taking to the extreme, but in this case, may prove worthwhile) of whether or not to recite the Pledge of Allegiance. I rather expect, with even just a little fairness in your explanation of America, she’ll be just fine reciting the Pledge of Allegiance.